Offering Free High speed WiFi Internet Access and Free Car Parking facilities, The Best Western Guide Post is one of Bradford's finest hotels with superb facilities, convenient location and very high standards of service. Our hotel is the ideal choice for both business and leisure visitors and includes . 42 individually designed bedrooms including 3 Suites. The check in time for rooms is after 1.00pm, and the check-out is before 11am. Fully licensed restaurant, offering first class English and Continental cuisine - It is advisable to check Restaurant availability at the weekends as the Hotel hosts Weddings and Functions. It is also advisable to check Restaurant availability on Bank Holidays, please note that during Bank Holidays breakfast times are subject to change. 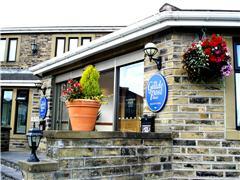 We will do our utmost to ensure your stay at The Best Western Guide Post Hotel, Bradford is fulfilling and enjoyable! Contact us now to arrange your stay, whether it be a holiday, business event, wedding or other special occasion. To search for a conference room or meeting room availability at Best Western Guidepost Hotel please enter the details below.